This traditional arts and crafts clock will look great on a mantel and has a chunky "manly" look to it. 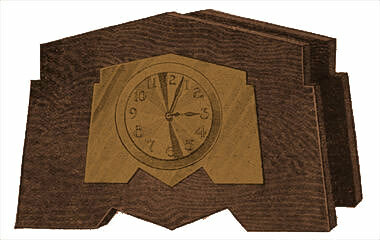 Click here for detailed arts and crafts mantel clock plans. This clock was designed especially for rooms furnished in mission style. If the mission effect is desired, an oxidized or copper sash should be used. Purchase a movement that is wide enough from the front to the back to allow the clock case to be made sufficiently deep for standing without being easily upset. Quarter-sawed white oak is the best material for this clock, but any other wood which works easily and takes a stain well may be used. Two pieces, 3/8 in. thick, 6-1/2 in. wide, and 8-1/2 in. long, will be needed for the front and back. One piece, 5 in. wide, 6 in. long, and with a thickness sufficient for the clock movement, is needed for the middle part. The thickness of this piece depends on the movement secured. After the front and back pieces are finished, and a piece of hammered copper screwed on the front as shown in the drawing, the middle piece must be made just thick enough to make the whole distance from the front of the copper to the back of the clock equal to the depth of the movement. Plane one edge on both front and back pieces. Lay out the design and the centers for the circular holes from this planed edge. Use a plane and chisel to cut the outside design. 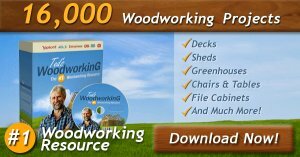 The hole can be bored out with an expansive bit, or sawed out with a scroll saw, and filed perfectly round with a half-round wood file. The bit will give the best results. If the bit is used, bore holes in a piece of scrap wood until the exact size is found. The outside design of the piece of copper is made to correspond to the design of the clock. The circular hole in the copper can be cut with the expansive bit by first punching a hole in the center to receive the spur of the bit, placing on a block of wood and boring through a little way. The spur on the cutter will cut out the copper. Fasten the copper to the front with copper nails or round-headed screws. The three pieces of wood may be glued together or put in two flat-headed screws from the back. The clock can be finished with a dark stain and waxed. Stain and wax the pieces before putting them together.